Christmas movies and TV holiday specials really add to the fun season. Seems like everyone has at least one favorite. Some are classics, like It's a Wonderful Life, and others are littler newer, like A Christmas Story or Elf. Every year brings another great movie or special to add to the list of holiday fun. At our house we have "movie night" every Sunday night. We take turns picking what movies we want to see. Of course, during the holidays we have lots of things to choose from to stay with a Christmas theme. Ready to add to your holiday movie collection? Best deals can usually be found by shopping at amazon.com. You can actually build a party around these great Christmas holiday movies. Plan a slumber party and watch them! Or just get together with your friends for pizza, popcorn and a holiday movie. 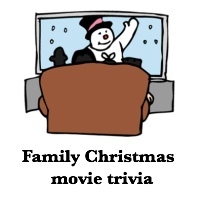 You can also purchase Christmas movies trivia printable games, they even have ones dedicated to old movie trivia (my favorite Christmas films are the oldies!) These are a lot of fun to print and play while you are watching the movie or getting ready for the movie to start. It is fun to see what everyone else thinks! Join our reader poll...all you have to do is pick! What is your favorite Christmas film or holiday special? Place your vote now! Vote for the Best Christmas Movie Ever! Start building your own Christmas DVD movie collection! My Favorites: Wondering what my favorite holiday movie is? I actually have two...and both include Bing Crosby. One is Holiday Inn and the other is White Christmas. In my book, you just can't get much better than Bing crooning the tune White Christmas! If you haven't seen them, but like old movies, you'll want to check them out! I also love National Lampoon's Christmas Vacation, Home Alone and Elf. These funny Christmas comedy movies never get old and always guarantee a laugh as you wait anxiously for your favorite part, or are surprised by a part that you had forgotten. Movie Munchies: Yummy snack recipes to go with your favorite movies. These go beyond popcorn. An easy way to impress your guests! One of my favorite snacks to eat while watching holiday movies is "Reindeer Chow." I've seen it called "Reindeer Food" and "Reindeer Trash" - it doesn't matter what you call it, it is great and quickly disappears! Even better is it is so simple to make and your youngest family members can help. To make it, combine a 2 cups of a cereal like Chex with 1 cup M&Ms (use red and green ones at Christmas time! ), 2 cups small pretzels twists and 1 cup of peanuts. Spread out the mixture on top of a sheet of wax paper. Next, melt 12 oz. of white chocolate chips in the microwave, and then drizzle on top of the dry mixture. Let cool, transfer to bowl and serve!